1Department of Behavioral Medicine, Sultan Qaboos University, Sultanate of Oman. 2Neurology Unit, Department of Medicine, Sultan Qaboos University, Sultanate of Oman. *Address correspondence and reprints request to: Hamed Al Sinawi, Urology Division, Department of Behavioral Medicine, Sultan Qaboos University, Sultanate of Oman. Al Sinawi H, Nandhagopal R, El Guenedi A, Obaid Y, Al-Asmi A. Treatable Neuropsychiatric Syndrome of Catatonia: A Case Review from Oman. Oman Med J 2013 Sept; 28(5). Catatonia is a potentially treatable neuropsychiatric syndrome less commonly encountered in developed countries these days. This review presents a case of a 19-year-old male with catatonic signs and symptoms compounded within a spectrum of a mood disorder, as well as literature review of the current treatment guidelines for this condition. There was no structural brain lesion or abnormality on cranial magnetic resonance imaging. The patient demonstrated favorable therapeutic response to benzodiazepine. This report discusses the management approach for catatonia through the case illustration, in an attempt to improve awareness and prompt recognition of this important disorder among physicians in Oman. Keywords: Catatonia; Mood disorder; Benzodiazepine. Catatonia is a neuropsychiatric syndrome characterized by disturbances in mobility and speech.1 This entity is often underdiagnosed but is potentially treatable; however, there are no existing well documented reports of this condition emanating from Oman. To improve awareness and prompt recognition of this disorder among physicians in the country, we present a case of a young adult patient who developed catatonia associated with a mood disorder and responded well to pharmacological treatment. The management approach to this important neuropsychiatric syndrome is also discussed herein. A 19-year-old college student presented to the psychiatric clinic at Sultan Qaboos University Hospital with a two-month history of insomnia, poor self-care, and poor appetite. He was observed by his family members to be virtually immobile, standing in a particular position for several hours (with the exception of obeying simple motor commands such as sitting down only when told). Subsequently, the patient had loss of speech and eventually stopped eating and drinking, and became totally dependent on his family for daily activities. In particular, he was not attending to his personal hygiene and refused to take a bath or change his clothes. His birth history and developmental milestones were unremarkable and his scholastic performance was average. However, at the age 7 years, he was diagnosed with mild depression based on the clinical findings of reduced psychomotor activity, social withdrawal, and reduced speech output. He made full recovery after psychiatric counseling. His mother died after suffering from breast cancer when the patient was 11 years of age. There was no family history of a similar condition. The family has always been supportive towards the patient. At age 13, he presented with an episode of poor sleep, increased activity and irritability, and over talkativeness. This time, he was diagnosed to have a manic episode and responded well to antipsychotic medication. The medication was discontinued 6 months later and he was observed to be ‘back to his normal self’ and could pursue his studies. There was no history of delinquency or conduct disorder, consumption of alcohol or illicit drugs, seizures, loss of consciousness, skin rash, joint or abdominal pain, or liver disorder. In addition, the patient was not on any medication at the time of presentation. Mental State Examination revealed a young man with poor personal hygiene and a thin body frame. He was conscious but made no eye contact. His body movements were very slow and he needed assistance to sit in a chair. Although he was mute and hypokinetic, he responded to axial motor commands to a certain extent. No hallucinatory behavior was noted. Since he was mute, the rest of the examination could not be performed. From physical examination, the patient was afebrile and had no tremors, pallor, jaundice, or Kayser- Fleischer ring (KF ring) in the cornea. His vital signs and ocular fundi were unremarkable. Except for marked axial and appendicular hypokinesia, and paratonic rigidity and waxy flexibility in the arms, there were no other lateralizing neurological deficits. He scored 16 in the Bush-Francis Catatonia Rating Scale (BFCRS). Laboratory parameters such as complete blood counts, electrolytes, liver, renal and thyroid functions, vasculitic screen, ceruloplasmin were all within normal limits. Slit lamp examination did not reveal KF ring. Brain magnetic resonance imaging was also normal. EEG revealed normal background activity and there were no ictal or interictal epileptiform discharges. He was diagnosed with catatonia and was prescribed oral lorazepam, and later amantadine. For the bipolar disorder, he was placed on maintenance treatment with amisulpride and lamotrigine. His catatonic symptoms showed gradual improvement within 3 days of starting the lorazepam, and after a week, he had no negative motor symptoms. He was subsequently discharged from the hospital when he communicated well and rode a bicycle on his own. He underwent follow-up visits at the outpatient clinic and lorazepam was tapered. He remained symptom-free at the subsequent follow-up 6 months later, and he had also secured a job as a gardener in a park. The current patient was diagnosed with catatonia based on the dominant clinical features of motor immobility, waxy flexibility, mutism, and prompt response to benzodiazepine. Since the patient had not taken any antipsychotic medications for nearly 6 years before the development of catatonic symptoms, the catatonic symptoms were probably not drug-induced. Other differential diagnoses included the following: a) Organic causes (encephalitis, space-occupying lesion, autoimmune diseases, metabolic disorders, illicit drugs, liver disorder, etc. ); and b) Functional causes (schizophrenia, mood disorder, brief reactive psychosis, conduct disorder, etc.). The case illustrates the association of catatonia with affective disorders,2,3 although catatonia was traditionally linked to schizophrenia.4 Furthermore, we would like to emphasize the importance of early and prompt recognition of this neuropsychiatric condition, in view of the generally favorable response to benzodiazepine. The diagnosis of catatonia is essentially based on clinical assessment and there are no supportive laboratory tests. Laboratory evaluation is usually pursued for uncovering underlying organic conditions (suspected on clinical grounds) which could be associated with catatonia. Catatonia is suspected in the presence of two or more of the following signs and symptoms such as immobility, excessive motor activity (moving around in vigorous random fashion), extreme negativism (extreme resistance to all instructions or maintenance of rigid posture against attempts to be moved), and peculiarities of voluntary movements, as well as echolalia (repeating the words spoken by the examiner)/echopraxia (mimicking examiner's gestures).5 In a case series of 165 cases of catatonia, the cardinal features of catatonia observed in more than 80% of cases were mutism, immobility, staring, withdrawal, and refusal to eat.6 Patients with catatonia often demonstrate paucity or absence of spontaneous movements such as shifting/turning while sitting or standing. They are usually mute with loss of spontaneous speech or the verbalization may be reduced to inaudible whisper. The clinical syndrome is termed akinetic mutism in neurological parlance. In any young patient with neuropsychiatric disorder, treatable conditions such as Wilson's disease should be excluded. Other organic conditions associated with catatonia include autoimmune encephalitis (such as anti-N-methyl-D-aspartate receptor encephalitis), hyponatremia, thrombotic thrombocytopenic purpura, substance abuse (cocaine, ecstasy), and medications such as ciprofloxacin.6,8,9 Abrupt discontinuation of medications such as clozapine and benzodiazepine can precipitate catatonia.6 Hence, caution should be exercised while discontinuing benzodiazepine in patients who have been taking the medication for long periods of time for indications such as insomnia. A brief diagnostic approach to catatonic disorder is shown in Table 1. 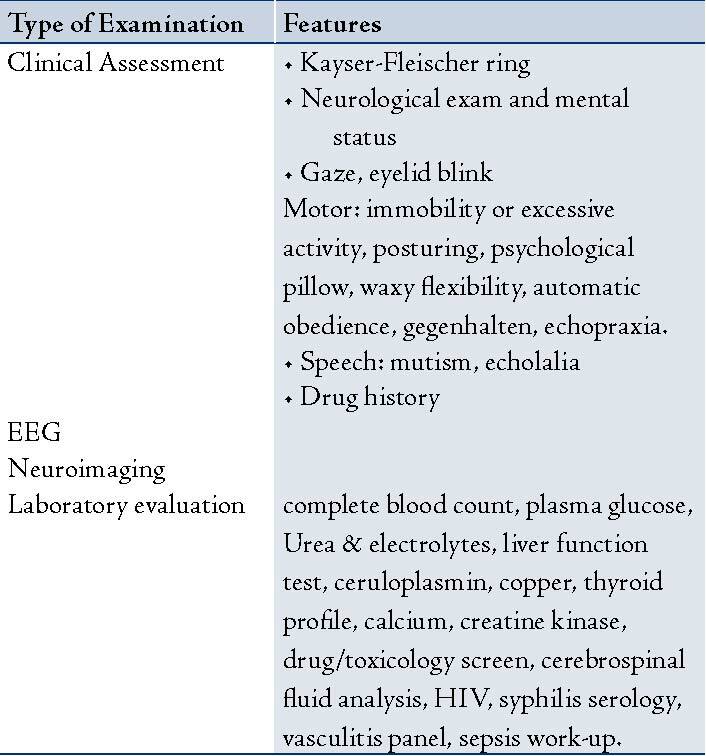 Table 1: Methods of diagnostic evaluation for catatonia. The precipitation of catatonia by dopamine receptor blockers is related to abnormal fronto-striatal dopaminergic activity (Fig. 1), while enhancement of GABA-ergic activity by GABAA agonists such as benzodiazepine and zolpidem is associated with an imbalance in the excitatory/inhibitory ratio. On the other hand, glutamate antagonists such as amantadine,12 memantine,13 (both being N-methyl-D-aspartate receptor antagonist) and topiramate,14 (antagonist at Kainate/α-amino-3-hydroxy-5-methyl-4-isoxazolepropionic acid receptors) block the excitatory glutamate receptors and restore the neuro-chemical balance in favor of inhibitory neuro-transmitter viz. GABA. This potential mechanism would explain the therapeutic effect of anti-glutamate and pro-GABA-ergic drugs in catatonia. Figure 1: Frontal neural circuitry implicated in catatonia. The motor (immobility), speech (mutism), and behavioral changes (social withdrawal and refusal of food) observed in catatonia could be explained by neurochemical alterations in the circuits involving frontal region: supplementary motor area (SMA, for the motor problems) and orbito-frontal (OF) and cingulate areas (for the behavioral and motivational problems). Thalamus is the relay station for output nuclei for basal ganglia (globus pallidus medial segment and substantia nigra pars reticulata to the frontal cortex). Functional alterations in the projections to and from the hypothalamus would explain the autonomic changes that are observed in malignant catatonia. 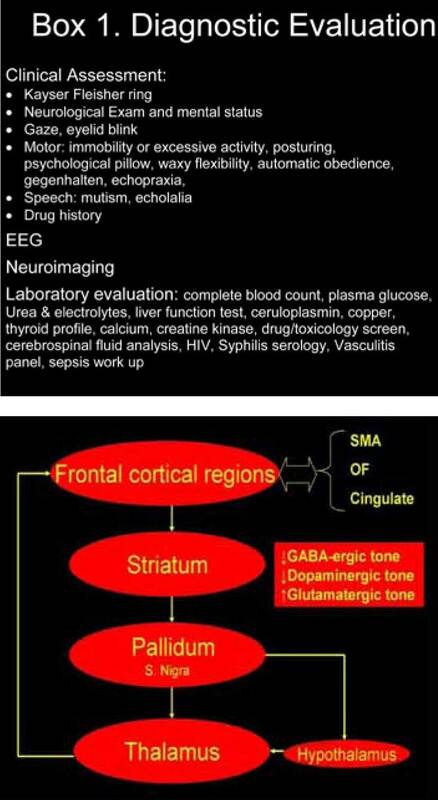 The neurochemical alterations reported in catatonia include reduced tone of inhibitory neurotransmitters such as gamma-aminobutyric acid (GABA) and dopamine and increased tone of excitatory neurotransmitter viz. glutamate. We described a case of catatonia from Oman along with its clinical diagnostic approach and management. We hope to highlight the importance of early diagnosis and prompt treatment in order to facilitate clinical recovery from this potentially treatable neuro-psychiatric condition. 1. Francis A. Catatonia: diagnosis, classification, and treatment. Curr Psychiatry Rep 2010 Jun;12(3):180-185. 2. Abrams R, Taylor MA. Catatonia. A prospective clinical study. Arch Gen Psychiatry 1976 May;33(5):579-581. 3. Barnes MP, Saunders M, Walls TJ, Saunders I, Kirk CA. The syndrome of Karl Ludwig Kahlbaum. J Neurol Neurosurg Psychiatry 1986 Sep;49(9):991-996. 4. Fink M, Shorter E, Taylor MA. Catatonia is not schizophrenia: Kraepelin’s error and the need to recognize catatonia as an independent syndrome in medical nomenclature. Schizophr Bull 2010 Mar;36(2):314-320. 7. Pommepuy N, Januel D. [Catatonia: resurgence of a concept. A review of the international literature]. Encephale 2002 Nov-Dec;28(6 Pt 1):481-492. 8. Carroll BT, Kennedy JC, Goforth HW. Catatonic signs in medical and psychiatric catatonias. CNS Spectr 2000 Jul;5(7):66-69. 9. Rosenfeld MR, Dalmau J. Anti-NMDA-Receptor Encephalitis and Other Synaptic Autoimmune Disorders. Curr Treat Options Neurol 2011 Jun;13(3):324-332. 10. Ungvari GS, Leung CM, Wong MK, Lau J. Benzodiazepines in the treatment of catatonic syndrome. Acta Psychiatr Scand 1994 Apr;89(4):285-288. 11. Osman AA, Khurasani MH. Lethal catatonia and neuroleptic malignant syndrome. A dopamine receptor shut-down hypothesis. Br J Psychiatry 1994 Oct;165(4):548-550. 12. Northoff G, Lins H, Böker H, Danos P, Bogerts B. Therapeutic efficacy of N-methyl D-aspartate antagonist amantadine in febrile catatonia. J Clin Psychopharmacol 1999 Oct;19(5):484-486. 13. Thomas C, Carroll BT, Maley RT, Jayanti K, Koduri A. Memantine and catatonic schizophrenia. Am J Psychiatry 2005 Mar;162(3):626. 14. McDaniel WW, Spiegel DR, Sahota AK. Topiramate effect in catatonia: a case series. J Neuropsychiatry Clin Neurosci 2006;18(2):234-238. 15. Mastain B, Vaiva G, Guerouaou D, Pommery J, Thomas P. [Favourable effect of zolpidem on catatonia]. Rev Neurol (Paris) 1995 Jan;151(1):52-56.